Aosoth is a black metal band formed in 2002 in France, a country home to such underground heavyweights as Deathspell Omega, Temple Of Baal and Antaeus. 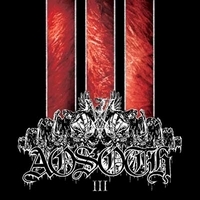 III is, unsurprisingly, Aosoth's third album and it is a bleak journey through six songs of unrelenting orthodox black metal. The atmosphere invoked in the songs is uniformly bleak and oppressive, the only difference being the form in which this crushing sonic assault is delivered. The music is heavy in the true sense of the word as you can literally feel each note weighing down on you, dragging you into the pit as it vomits forth from your speakers. The sound of Aosoth will be familiar to fans of French black metal, albeit not so blasting as, say, Peste Noire or Épuration Satanique. It has that same rawness that I for one have come to associate with French black metal bands more than any other. The doomy overtones and crushing atmosphere of this record are executed perfectly and across the layers of hateful musical darkness MkM's screeches echo like daggers in your mind. Vocalist MkM you may recognize from Antaeus as well as an early incarnation of Temple Of Baal and other underground French black metal. This is an album for those who want pure black metal with all of its dark associations.